Flight Of Lovers - Kimono Series is a tapestry - textile by Susan Maxwell Schmidt which was uploaded on May 4th, 2015. 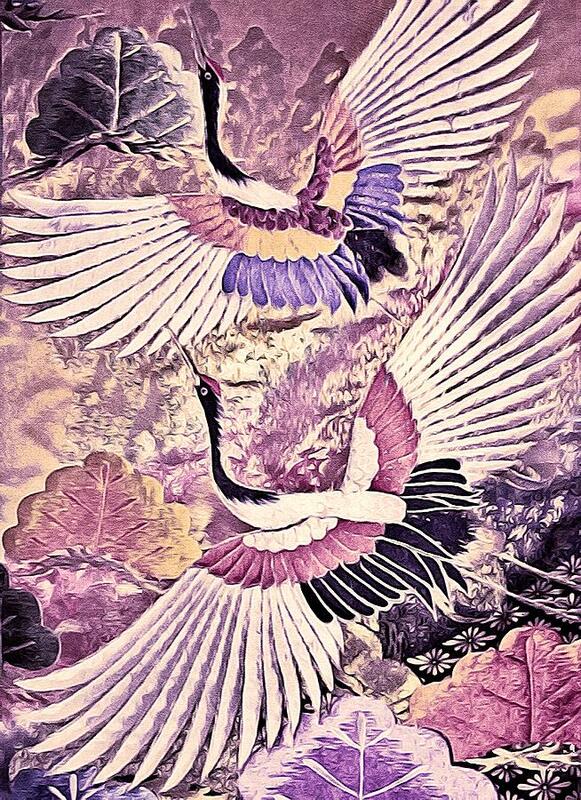 "Flight of Lovers - Kimono Series"
A fine art photograph of a crane couple in flight embroidered on a vintage Japanese silk kimono, turned stunning fine art painting in contemporary colors and textures through the magic of digital photo painting. I used mauve, orchid, lilac purple, yellow, black, white and ink blue as the color palette for my avian lovers. This artwork is available in a variety of framed and unframed gallery-quality giclee prints, home decor items such as velvety soft duvet covers, fabric shower curtains, and square and rectangular decorative throw pillows, as well as greeting cards and tote bags. Please visit my Painted Photography art gallery to see all my digitally painted photographic images. This artwork is available in a variety of framed and unframed gallery-quality giclee prints, home decor items such as velvety soft duvet covers, fabric shower curtains, and square and rectangular decorative throw pillows, as well as greeting cards and tote bags. Copyright 2015 Susan Maxwell Schmidt, all rights reserved. Brava Susan! Your artwork is featured in Women Who Run With the Wolves. Congratulations, your art work is featured on the homepage of "SURREAL PERSPECTIVES" group! Brava Susan! Your artwork is featured in Mutamea - My Change. Beautiful. Congratulations on your sale, Susan. Beautiful flight of the bird, and great painting!